Aston Villa boss Martin O'Neill has been named Premiership manager of the month for April. Villa were unbeaten for the month, winning all three of their away games. Trips to Blackburn, Middlesbrough and Manchester City earned nine points and draws were secured at Villa Park against Everton, Wigan and Portsmouth. The spell has seen O'Neill guide the Midlands side to 11th in the Premiership table after a brief spell among the teams battling relegation. 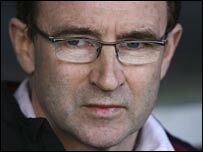 O'Neill has won the award four times, his last coming in November 1999 when he was manager at Leicester.